There is a specialty in Atlanta the end of January that we are going to try to budget in. Or we may wait for Houston in July. There was talk about building a major with the females in Dallas, but now I am not sure that will pan out. Question: In our area it only takes 4 dogs for a major and 6 females. If they don't build a major in females, but have 5 entered and Chance wins BOW, how many points would that be? Although 3-4 points is a major considered a major... does it count if the females did not build a major? I would much rather have a major via the dogs... but there are so few showing in our region. I really need to get together with the breeder and get some advice about show locations that they recommend. It looks like we will be going to Atlanta! Atlanta looks like it's going to be well attended. Just got the Infodog mailing on that set. My daughter wanted to attend that one. We also had Westminster (Feb)on the horizon (Rory qualified, but not likely to place, just for the experience of doing it). Likely will skip that due to the cost involved. Chow Nationals is in March, and would really like to attend that one (16 hour drive). Did anyone see the National Dog Show entries? Only 1 Chow. (Non)Entries were primarily driven by the judging selection and a 12 hour benching requirement. Everyone I know went to Syracuse NY instead. Now, I have been keeping my eye out for a new Chow. Entering Rory just for the GCH campaign seemed a bit off for some reason, and Amber really isn't that interested, she would rather just sit about at home. But...now it may just be that we have the chance to get that pup we have been looking for. Potentially a top quality pup with national ranking ability. I think I read somewhere that you are thinking about a male puppy??? We are contemplating a female puppy in the summer of 2015 (maybe) There is a possible breeding that I am interested in, but I am not sure if they have decided on the pairing for certain. Then there is the waiting to see if a female in the litter is show quality and available. Crazy, but I already have a name picked out if they pair the two that I am hoping. My husband tells me that is a prime example of pulling the cart before the horse. I wanted to go to Chow Nationals, but could not fit it in with our schedules and budget. We are going to Atlanta and then just hitting a few of the larger shows that are within 150 miles of us. There are several shows coming up that are close, but I am really tired of going up against the same dog every weekend. My husband said Chow Nationals 2016 we will go with two dogs. Updated photos.... We are gearing up to begin entering the ring again. It has been over 6 months and I am a bundle of nerves. Dallas has 6 dogs entered both Saturday and Sunday - July 4th and 5th. I wish we could have hit a couple smaller shows for warm up ... but, I am excited to see how he stacks up with the competition now that he has filled out a bit more. He is now 18 months old. Wow, those photos are better than the others you posted. He looks absolutely fantastic. I wouldn't worry about a thing. We had a rough 1st day out with Rory after a 6 month lay off, but that was with a switch to me handling him. 2nd day out he was back to his usual show self with personality on display. I am still in such a learning curve. Simple things like reading each dog and how he prefers too be led. Rory requires a dead tight lead and will be right on my knee, Toby prefers a bunch of lead or he will gait sideways and lag. I am hoping my husband will be able to attend this show so that he can video tape. It would be awesome to view our ring time so that I can watch and learn what areas we are strongest and weakest. I will post a picture as soon as they are available.... Chance won his second major and has enough points for his CH! Best of Winners in Dallas on Sunday. Saturday was our first time in the ring in 6 months and we were a bit out of sync. (actually Chance did well, but I was jabbering nervously non-stop) Poor judge probably thought I was a tad bit mental. Congrats Cindy. I posted on the other thread as well, but the judge arrived at the right decision....and I mean with Chance, not you. I find that chatting with the judges is usually a good choice. Make it personal. Let them know that you are an owner-handler. Play up your inexperience a bit. Let them know the dog has been out of the ring for a while. With Rory, I will joke with them about his tongue being out. Sometimes they will comment that they have seen the mouth while checking the bite (I did have one judge insist that I get his tongue back into his mouth for bite inspection, but that was odd). I had another recently that reversed the process and wanted to see the bite last. He was trying to throw the dog out of his routine. And another that wanted to see the dogs expression. He didn't explain what he was looking for, but wanted to see the dog up his ear position and show some 'personality'. All in all, I wouldn't worry about what the judges think of you. In most cases they are way more off the wall than you could have been with a bit of nervous small-talk. Way up here in the north, we have to network to get any majors for Chows. Rory has been up against the #2 Chow in the country for the past 4 months. Not a prayer at taking BOB, but we know that. My pup (Toby) was out of that breeder and we often stand ringside during Class dogs and comment aloud on each others dogs..."Wow, that dog is so square", "What a nice head on that one", "Haven't seen a stilted gait like that in years". Who knows if it makes a difference or not. Sometimes you can see a handler develop a rapport with a judge. When that happens, we will make an effort to interact with the others dog. A quick touch up on the other dogs tail with a brush lets the judge know that you have some sort of an interest in it. Anyway, way too much goes on out there to worry that it didn't go as well as you would like. You got that result, and deserved it. Saturday Chance took BOB in a small show. He performed really well in the ring. Just after the show I was getting ready to crate him. 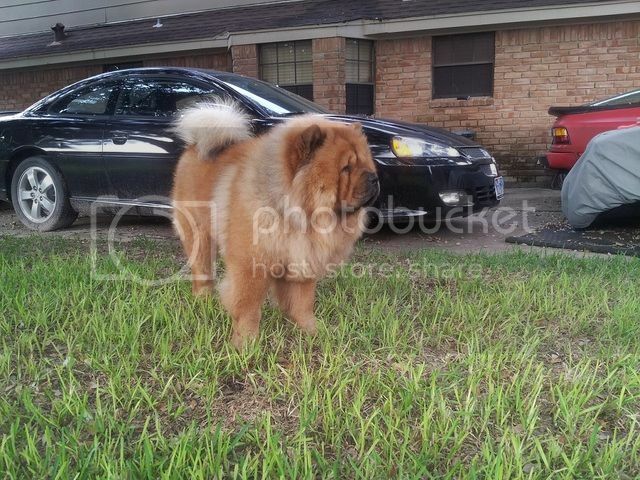 Another chow owner offered to hold him for me while I checked the show times for group. I handed her his lead and walked away like it was the most normal thing on the planet. Chance didn't make a sound. He simply lurched to follow me and snapped his new leather lead in half. The other owner screamed my name and "Loose Dog!" Before I could say a word over 20 people were chasing - grabbing at Chance. He freaked out, I could see the panic in his eyes. As I called his name, another 30 or so people were chasing him. Oh my goodness, it was complete mayhem in the grooming area. Chance was looking for an exit and everyone was making wild grabs at him. Finally a guy blocked him in with two folding chairs and I was able to grab him. The problem was after all of that, Chance did not want to walk anywhere where any loud noises were. Which means he did not want to enter the ring for group because people were cheering as we entered. For the first time since we began showing he had his tail down. I forced him to walk.... debating whether or not to ask the judge for permission to leave the ring. He ended up calming down enough for the judge to go over him. His walk was anything up beautiful (completely apprehensive) stopping every few feet. Sunday, I entered him again. He was some-what better, but still a bit apprehensive. Crazy thing on Sunday... the judge told me that he is scared of the larger chows. Chance was relaxed around the judge, just the walk around the ring with people clapping had him hesitating. So... all of this is to ask, what are some ideas to help rebuild his confidence? I would really like to help him earn his GCH in the next 5-6 months of showing if possible. Cindy, get him back into the handling classes. Practice and getting him used to being around the other dogs. Make it normal again. I have seen that 'loose dog' scenario a few times, and no wonder it spooked him. If it was just a bunch of experienced handlers trying to gather him back it would be fine, but then you add the venue security, curious onlookers, and people who have no clue about Chow mentality, its rough. The focus they need can really be sidetracked pretty easily. At our last show, we did really well day 1, and then on day 2 I found both my males looking around for each other. They were head bobbing and stopping on the down and back trying to figure out where the other one went. Not a pretty sight. You may also want to enter him in a show or two where the GCH pts aren't on the line. A smaller show or two, but watch for judges that are really light on inspection. If you don't already look, there is a FB page for judge feedback. It could be really helpful. BTW, don't get discouraged if the GCH timeline doesn't quite happen. We have had Rory out for GCH for about that same time and he is about 1/2 way there. Majors for males in this area is still a problem, and with GCH you don't get the x-over points. So getting those majors is tough. And unless you have a good number of CH dogs showing, the competition wins are hard to come by. It might be better in your area. We are constantly showing against the #2 Chow in the country...somewhat by design since we are very good friends with the owners of that dog, so we are awarded Select Dog almost every time out to the BOB. Since we are also entering Toby, and trying to get his CH we compete against ourselves as well since we need Winners Dog for him (he is pointed out and only needs his Majors to finish). I think you should know Chance better than anyone. So I don't think that will happen again. We were at a show last weekend and saw people only had their show leads on at ring side just before they went in. Other than that they had a sturdy collar/leash on. My point is show leads aren't meant for anything other than in the ring. I think you will be fine if you do that or kennel him afterwards. We haven't been to a show with Brutus for about 8 months until last Sat. and had a great time. You would think Brutus would be nervous and rusty but that wasn't the case. 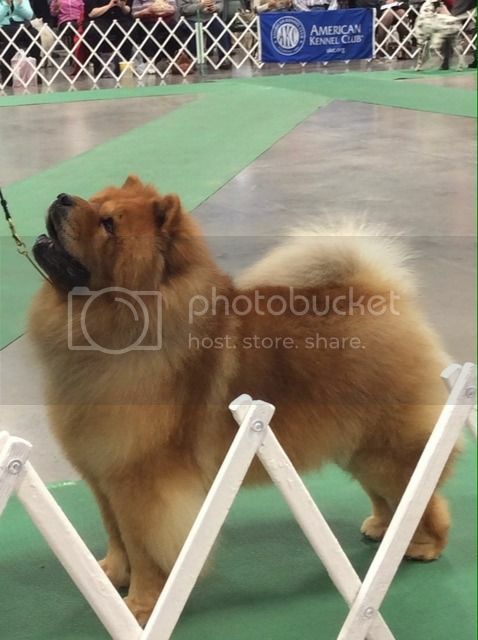 Won breed because he was the only chow entered and then received a group 3 in Owner Handler . Pretty cool since it was our first time competing in Owner Handler Competition. Then he was showed by a friend in groups for the first time. Didn't do anything but he looked great and was having fun. We got our moneys worth by going in the ring 3 times at one show and was glad we didn't enter him on Sunday. Thanks for all of the tips! Brutus looks great. Congrats on the OH placement! That is awesome!!!!!!!!!! Just wanted to give an update: We showed Chance two weeks later at the same venue (hosted by a different club) He hesitated slightly going in the building and then acted like his normal confident self. This past weekend we showed for three days in Dallas. We had a blast! Chance had a bit too much fun on Saturday and "bunny hopped" around the ring. He was a complete goof ball, extremely animated. Friday and Sunday he took Select be hind Pilot. If you get a chance to see Pilot at Uekanuba take advantage of the opportunity. He will be going back to China after the show. He is an awesome dog and we did not mind placing behind him. 1) Not hovering too close so that the judge has a better view of Chance. 2) Correct feet placement. He will stand with his front feet pointing every-which-way if I am not paying attention. Still searching for a treat or squeaky that will grab his attention. He is not even mildly treat motivated in the ring. I find special treats that he loves and only offer them in the ring.. and he turns his head away. *argh* Too many things more exciting than treats going on around him. We had a blast, even with the naughties. He is so much fun. I am so pleased with his great personality. Congrats on the placement Cindy. Select to Pilot is definitely nothing to be worried about. He recently showed here and we didn't enter because Toby is Pointed out and only needs major wins. Glad to hear Chance is back on track. I understand the distraction thing and lack of baiting. Having both my males in the ring at the same time has proven to be challenging. They just keep looking for each other. Toby, I can understand, he is still young, but Rory has been at this for 3+ years and is 1/2 way to his GCH. He should know better. But keeping his focus can be hard. Outdoor shows are always tough as he just would rather sniff the grass. He will bait really well outside the ring, and I don't over do it, but once we are in, he ignores everything. I have found the best thing is just to keep interacting with him. Verbal encouragement and some loose play/rubs refocus him a bit. When we aren't on the ramp or doing the down and back, I will alternate between trying to bait him and getting him to focus back on me. I get low and rub his chest or chin. I will drop the show lead and give him a swoosh on his hind quarter. It distracts him a bit which actually helps him to remember what he needs to do. Sounds counter-intuitive, but was a great recommendation by a friend. Before I started handling him in the ring we had to hide so he didn't see/smell us. Way more fun doing it this way. Show burn-out. 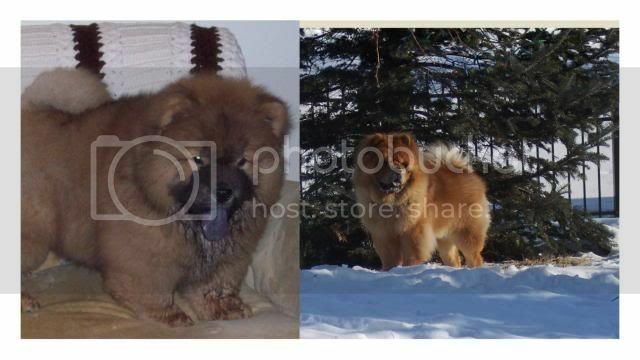 Way too many shows with no other chows entered. A few we showed at anyway because they were close, but several we just dropped out of. Chance's last show was one of those nearby. Oh My Goodness... Saturday he was on his game. He stacked beautifully and carried himself with such dignity around the ring. He was pulled in group but did not place. Sunday......... it rained and the grooming area was a good fifty yards across the parking lot from the covered rings. Rather than enter the ring soggy, I decided to find a corner of the show building that had a bit less traffic and we sat there for 2 hours between Breed and Group. It was too noisy and too much going on for Chance to get any real rest. He would sprawl out on the floor and people would come up and want to pet him because he looked so sweet. He is sweet, but all the fondling made it tougher for him to relax. We entered the group ring and began the walk, as a group... Chance bunny hopped most of the way around. He was full of the wiggles. I placed him in a beautiful stack but had trouble getting him to focus on me. I finally knelt down beside him and firmly told him to straighten up. I placed a couple fingers under his chin and lifted, giving him an awesome profile. He looked great. He stood there, holding position..... until the exact moment that the group judge stood in front of us. He then reached a paw up and playfully knocked my fingers away from his chin and looked up at me and wagged his tail. I think his whole body was wagging. I am tired.... Chance loves the road trips and one on one attention from me. He could do this every weekend. Re-evaluating our weekends. I think we will change game plans completely. We will probably skip most smaller venues from now on; hitting much fewer shows, but travelling greater distances. What I'm seeing is that people who are shôwing chows are tired of wasting money on entries when they are the only ones entered. Seems to me also that new puppy's starting their campaign is way down. I wouldn't be showing Brutus if we didn't get Spartacus. I'm glad we can just go to the local shows and one of them will get a point. Plus, Brutus can get points for NOHS because we decided he will be the only one entered for that. Showing a special is different than a class dog. I personally like showing a class dog because finishing a dog is more important to me. But I think having one of each will be fun too and am looking forward to it. It will be more work but if I didn't like to do it I wouldn't. 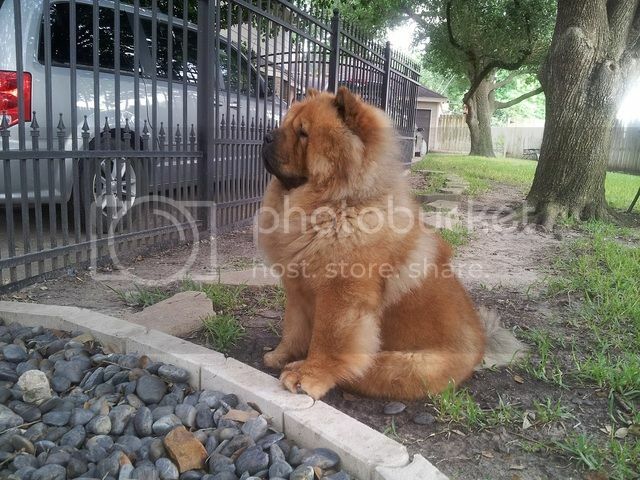 I would ask your breeder and other chow people to build shows with chows. They are in the same boat as you. There is even a group on facebook that is for building majors for chows. Hang in there and good luck!!! !